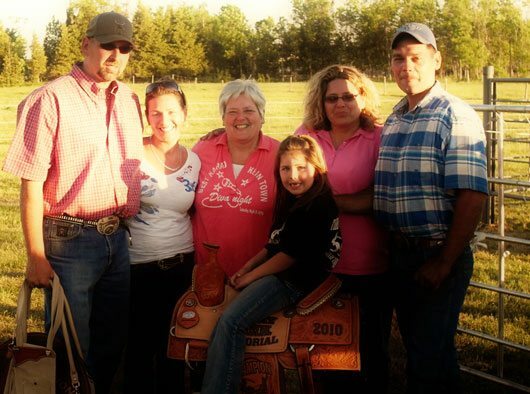 Saddle winner, Trevor Dunk, shown with the family presenters - left to right, Trevor Dunk, Teri Lee Dunk, Cheryl Dunk, Tayler Dunk, Tracy Pighin and Al Pighin. The average winners, Trevor Dunk and Jason Thomson with Teri Lee Dunk presenting. The first place winners also received rope bags made by Ken Boroski and donated by the Scully family as well as leather jackets donated by the 730 Truck Stop in Cardinal, Ontario. Second place received breast collars made and donated by Ken Doner. The top lady header and heelers, Lacy Beer and Dawn Civiero received halters, made by Ken Boroski and donated by Teri Lee Dunk. The fastest time of the day was 8.16 by Trevor Dunk and Tim Carnes. High point winner, Trevor Dunk, received the trophy saddle. The added money was donated by the Dunk family, Jeremy McCulligh and Dawn Civiero. 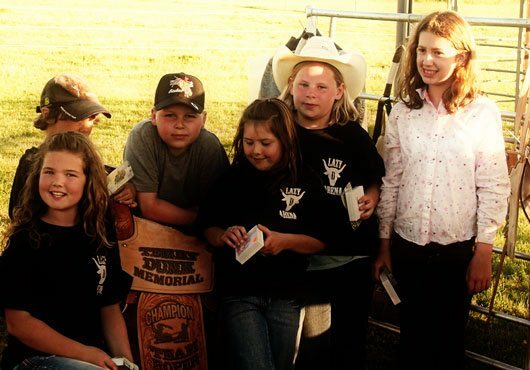 A kids barrel race was held and all the kids received prizes. The winner of the barrel race was Tayler Dunk. They also held a “team barrel race” where male/fermal partners were drawn. 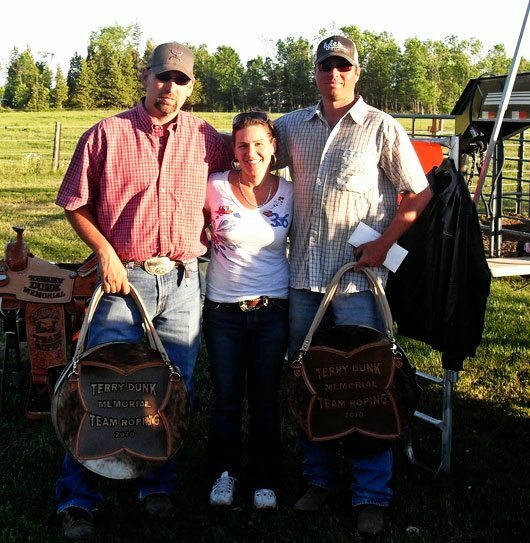 The winners were Jodi Swearingen and Jim Woods (Jim is Teri Lee’s father and travelled from Nova Scotia to attend the roping). Participants in the kid's barrel race - from left to right - Max Pearson, Abby Pearson, Brendan Bowie, Tayler Dunk, Mckayla Hart and Piper Dunk. The weather was great, beef and pork barbeque after the roping was delicious and everyone had a great time. The Dunk family would like to thank all the ropers who came, the sponsors and all the people who helped make this roping a success.